Rear Porsche Pattern (5 on 130) and Rear Chevy Pattern (5 on 4 3/4) rear drum. These drum fit 1968 and later Type 1 VW's and have both Porsche and Chevy pattern on them. 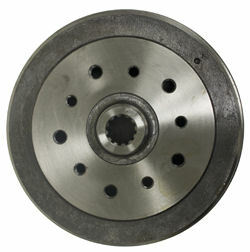 Also available in a 1967 and earlier short spline for $10.00 more. When installing these on early swing axles you will need to use late model backing plates with the adjusting holes or make the holes in the drum to adjust the shoes. Click more info to choose the ones you want.